It’s been 12 years since Alice In Chains reactivated with vocalist William DuVall - making his time in the band roughly twice that of Layne Staley, but the shadow left by Staley was cast dark and long across the band’s last two albums Black Gives Way To Blue and The Devil Put Dinosaurs Here. Both competent albums that for better or worse clung to the AIC sound of old. 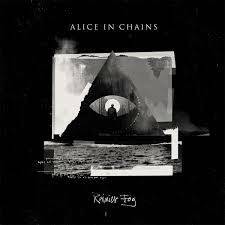 With Rainier Fog, however - it would appear that DuVall has been given more carte blanche and along with guitarist Jerry Cantrell, bassist Mike Inez and drummer Sean Kinney, Alice In Chains have released their strongest effort since their 1995 eponymous swan-song. Opening the album is first single "The One You Know". Aptly titled, as it contains every chunky riff and harmony we’ve come to expect from AIC. The title track follows and it’s here that we see the paradigm shift to the unexpected. Unexpected, not unwelcome, mind you. DuVall’s influence becomes more apparent through numbers like "Red Giant", "Fly" and "Never Fade" - all of which are guaranteed to be stuck in your head on any given day after subsequent listens. The latter, "Never Fade" and "Fly" are probably the least-sounding AIC tunes on the entire album, perhaps even in the band’s entire catalog, but they both come across very much like an organic progression in the band’s sound as opposed to a preconceived, calculated risk. Where Alice In Chains go from here is anyone’s guess, but it would seem the stability of the lineup and the high quality of music being released this late into the band’s career has reinvigorated them for the long haul and we’re the ones lucky enough to be taken along for the ride. Posted Sept. 10, 2018, 9:40 p.m.
Posted May 6, 2018, 10:01 a.m.
Posted March 18, 2018, 10:20 a.m.
Posted July 24, 2013, 8:21 a.m.